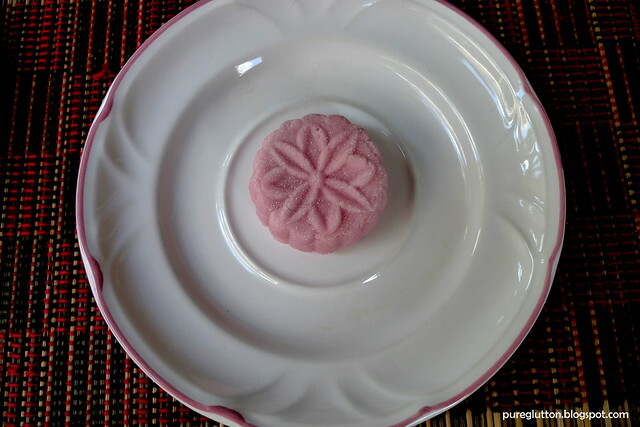 Inspired by the many beautiful photos put up by fellow food bloggers in their blogs, I decided to try my hand at making some “ping pei” (snowskin) mooncakes. 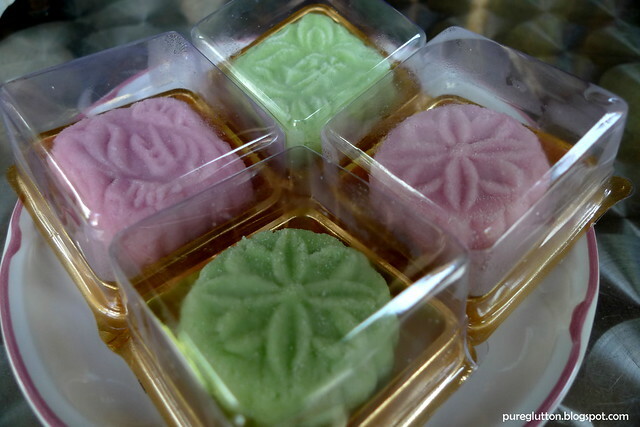 I’m not much of a mooncake fan so that’s why I opted to try making some mini ones. 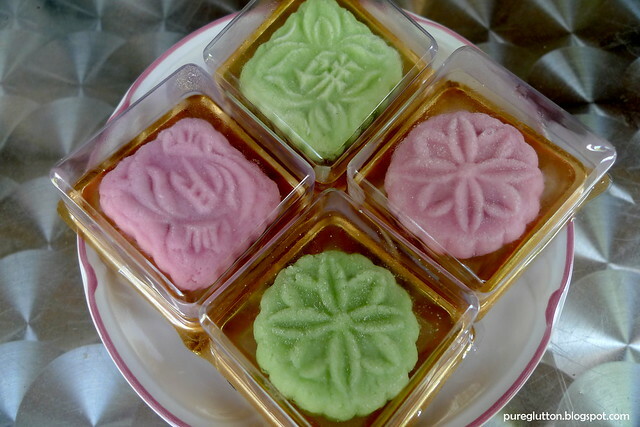 Being small, mini mooncakes are not that “jelak” and I do think they look cuter too! Ping pei moonies are not that difficult to make, actually. It’s the same principle and procedure as making Angkoos! Furthermore, there is no cooking or steaming required… so it’s really easier than making angkoos, hehe! 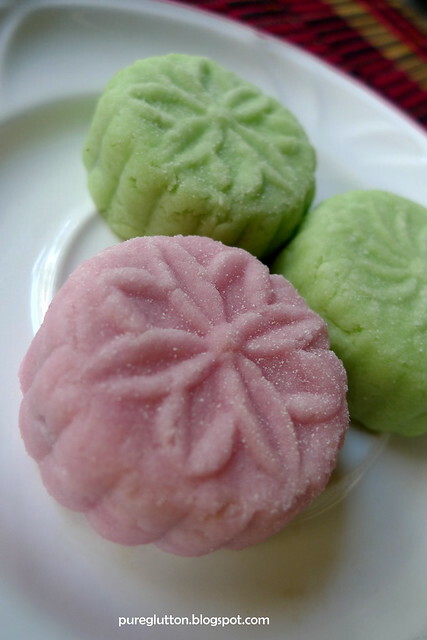 I prefer making the ping pei moonies and not the baked version because for ping pei, I can actually try making a variety of colours and fillings too. The pastel shades are so pretty, don’t you think? So, yesterday being a public holiday and I had no plans to go anywhere, I gathered all the necessary stuff and spent a couple of hours trying to make these moonies. This was the very first time I ever made any mooncake, haha! Yes, I know they look kinda amateurish… much can be improved! I only experimented with 2 colours yesterday… all from natural ingredients! 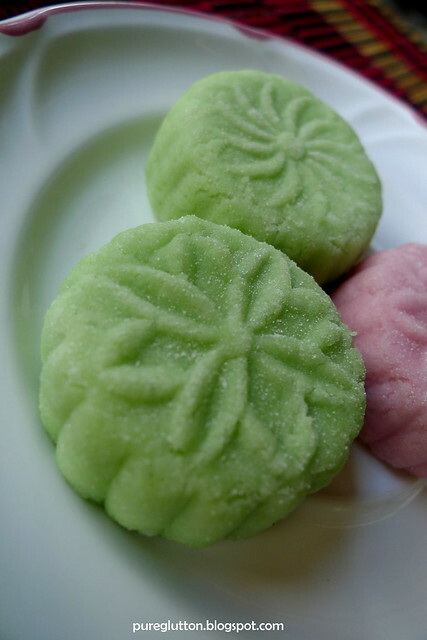 For the green ones, I used freshly-made pandan juice and the filling was pandan lotus paste. 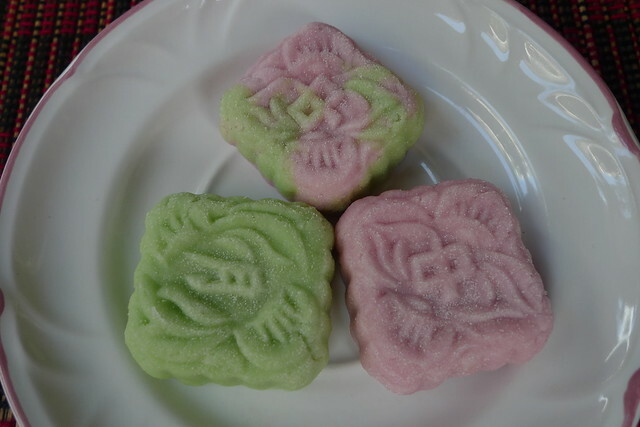 For the pink ones, I used beetroot juice and filled them with redbean paste. Just a small of amount of beetroot juice is enough to give this lovely pink shade! Oh, I also added in generous amounts of melon seeds into the filling to give it that extra crunch and bite! I ended up with more than 70 pieces of these in my fridge. Besides giving some to my neighbours, what I did was pack them into individual plastic containers like these (of course nothing as fancy as those you can get from the restaurants or hotels!) and I gave them out to my colleagues this morning! Reading masak-masak’s blog has inspired me to try other variations… and that’s going to be my project this weekend! Hey Boo, thank you for all the great photos and ideas! gosh u should send some to melbourne hahaha..
Sooo sweet and pretty! Texture-wise, how is it? Chewy-ish? Or soft? I saw some recipes that contains milk, and some even require the dough to be steaming. Is yours the basic recipe where you just add sugar, shortening, etc to the koh fun? How do you get the coloring from beetroot? The color is really natural and nice. Joe: I'm afraid they may not clear the super-strict Ozzie Customs lah! gfad: Ya I used the basic recipe for this 1st-time attempt – dare not be too adventurous! I steamed the beetroot, blend it into a paste, which can be kept in fridge for some time. 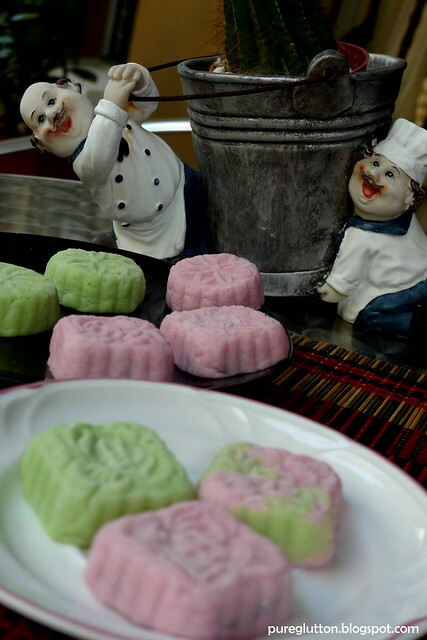 For this mooncake recipe, i used abt 1 tsp of the paste, mix with 200ml water, strain it be4 adding into the dough! A little goes a long way, beetroot colour is really keng! Pls teach me how to use the plunger-type moulds, dunno how they work! Can google/youtube hoh? Sean: Nahh, the amount of beetroot i used was merely 1 tsp – cant taste the flavour really – i just wanted the colour! 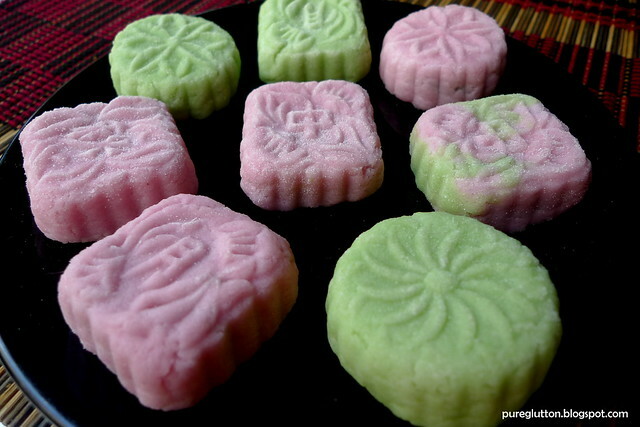 Wow these mooncakes actually look really good for a first timer. How long did it take you to make these? Baby Sumo: Thks for dropping by. Took me a couple hrs to make these, hehe – no cooking required! Just pop them into the fridge. It has been a while since i last had Ping Pei mooncake. I remember i love it straight out from the fridge. Wish I could have some now. I love lots of melon seeds too. As usual, all turned out looking scrumptious with ya magic hands! Nice effort! Happy Mid Autumn Festival! Love the colour, can't believe it's from natural ingredients! P.Pea: U can try making them – it's really easy, actually! Oh yes i luv the crunch of melon seeds! Yep, no cooking involved – just pop them into the fridge after u hv made them! ChoiYen: Yes, the natural colors are really lovely – much better than artificial coloring! Xara: Gurl, not sure if these can get past yr sticky US Customs, hehe! Will keep some in the freezer for u until yr next visit here la, LOL!